It’s time for another update from DrupalCon Copenhagen! This time around we have updated information on the core developer summit, the unconference, and the code sprint. First of all, we are happy to announce that the final version of the program is now available on the site. The few remaining slots in the schedule will be used for sponsor sessions and lightning talks. We’ll try to keep schedule changes to a minimum, but if we do have to shuffle a few sessions around, this is the page to watch. Also, we’ll make the entire program available as a PDF if you would rather keep it on your laptop or print a copy to keep in your pocket during the conference. 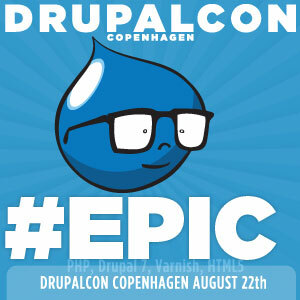 Now that the program has been finished, you can start planning your DrupalCon Copenhagen. Go to the session schedule and add all your favorite sessions to your personal schedule. You can see a list of your chosen sessions by going to your user profile and clicking the “My schedule” link. If you’re in Copenhagen on Sunday, August 22nd, and interested in helping improve Drupal core, you should participate in the Core Developer Summit. The summit will provide opportunities both for people to discuss changes to Drupal code and processes as well as people interested to move Drupal 7 closer to release. The summit will start wit three shorts sessions by Dries Buytaert, Sam Boyer, and Jen Simmons. After the kick-off sessions, the summit will break up into two groups, with plenty of space to be fruitful and get stuff done. All ideas are welcome! On Monday, August 23rd, you can take part in the unconference and connect with the local open source community and other Drupal users and developers. The unconference will be run barcamp-style, meaning that we will create a schedule from the presentations suggested by the participants. The unconference will not be catered, but there’s a mini market and vending machines at the venue if you want to grab a snack. We have picked two sessions to get the day started: Hagen Graf, who is writing a book on Joomla! 1.6, Drupal 7 and WordPress 3, will give a short introduction to the three CMSes, and Christian Jul from the local TYPO3 community will give an introduction to TYPO3. If you buy a ticket for a training session together with a ticket for the conference, you will get a discount of €30 on your conference ticket. During the conference we have plenty of space set aside for ad hoc birds of a feather (BoF) sessions. These sessions will be a perfect opportunity to discuss topics which are not covered in the main program. The BoF schedule is available on the DrupalCon site. During the conference, the schedule will also be available on the official BoF Board in the lobby. See the Birds of a Feather page for information on how to add your session to the schedule. After the last day of sessions, you can participate in the post-conference sprint. This sprint will focus on improving Drupal documentation, working on translations of Drupal core and contributed modules, fixing issues in the Drupal 7 queue and working on various front end issues. Developers of all skill levels are welcome. If you’re a Drupal rock star, you already know what to do, but if you have just started working with Drupal, we’ll help get you started. The code sprint will take place at the conference venue from 9am-5pm. Finally, we want to mention the ChX Coders Lounge. This is the place to go if you would like to work on Drupal core or one of your pet projects with other dedicated Drupal developers. The coders lounge is open from 7pm to 5am Monday through Thursday.